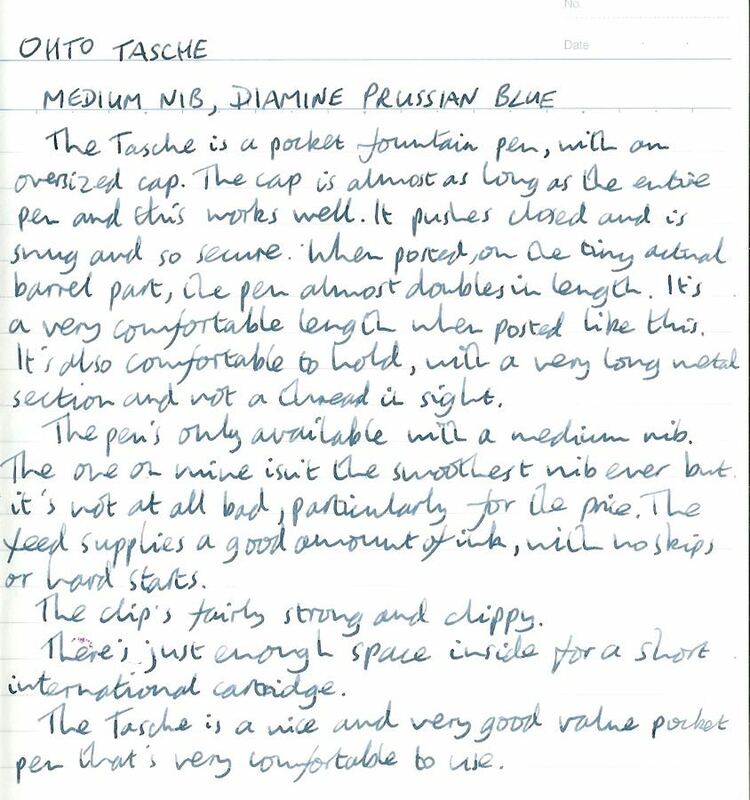 OHTO Tasche Fountain Pen Review – Pens! Paper! Pencils! OHTO began in 1929 making dyes and ink. 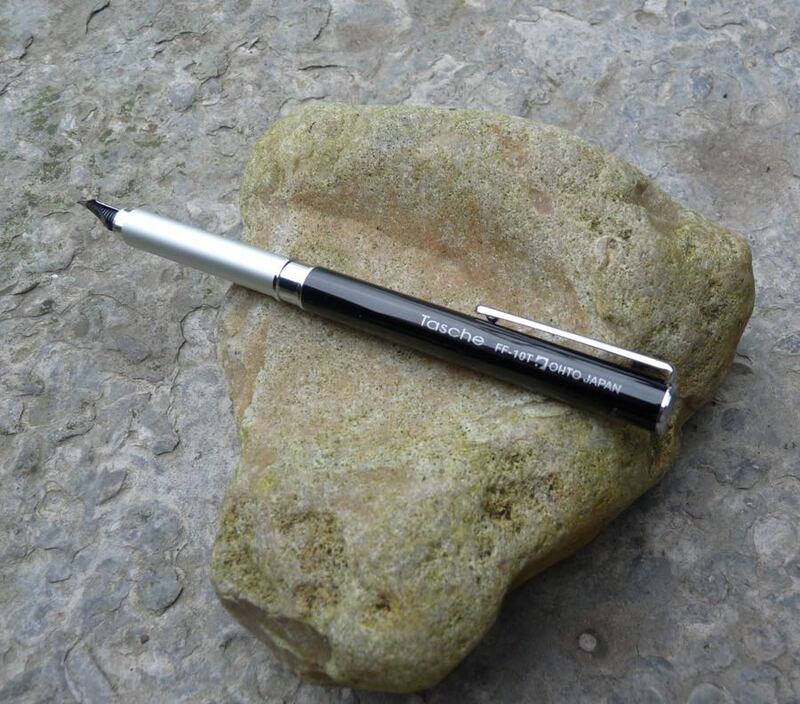 In 1963, they produced the world’s first rollerball pen. Their Graphic Liner was the pen that opened my eyes to the world of pens beyond the Bic ballpoint. They have a fine history. However, their fountain pens have a mixed reputation, to say the least. The Tasche is a good looking metal pen. 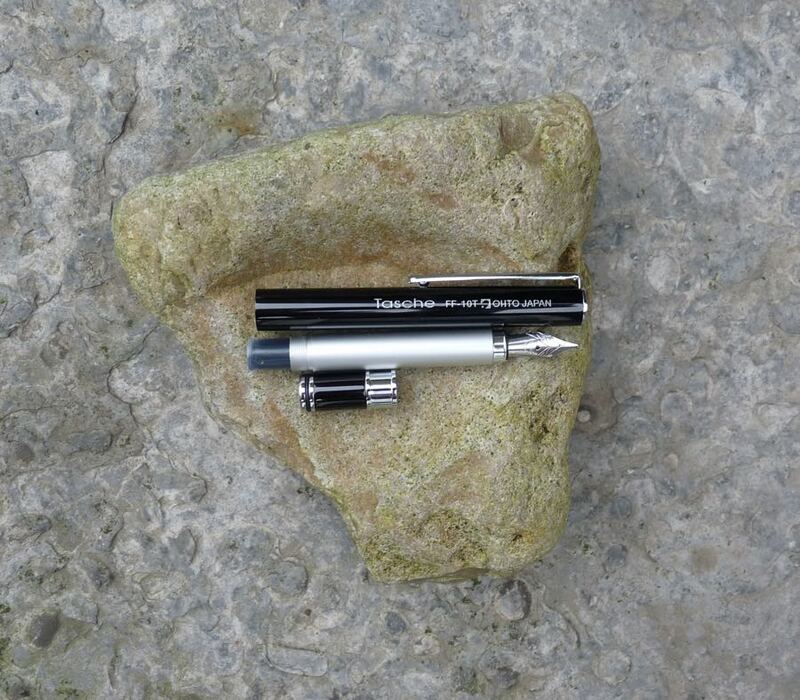 It’s very compact when capped but the big cap extends the pen to a reasonably comfortable length when posted. It’s a slim pen and it has a metal section. You’re not going to want to use it to write the next War and Peace but it’s plenty good enough for note taking. 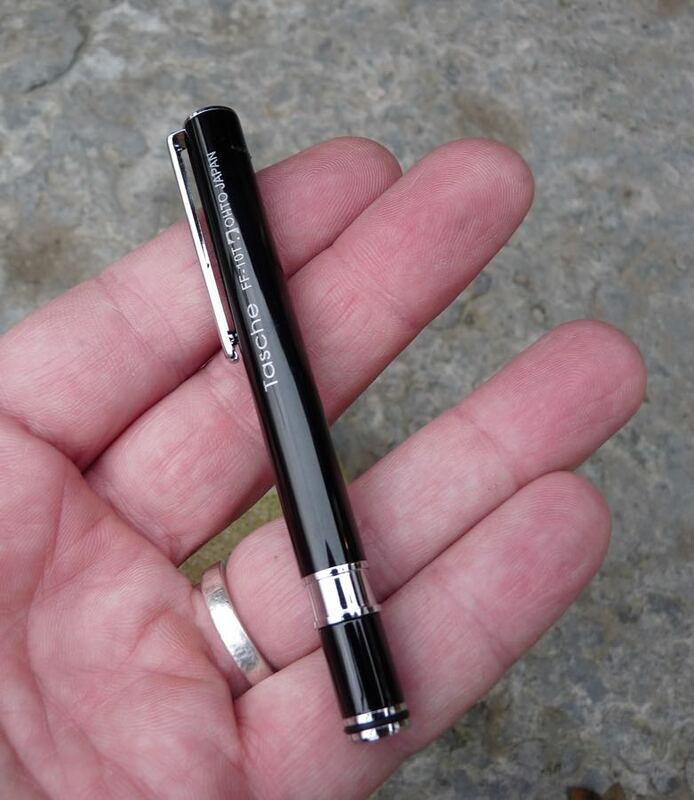 This is a pocket pen and a pocket pen has to make the transition from as small as possible to as big as possible with as little fuss as possible. The only pen I’ve found that does this as well as the Tasche is the Kaweco Sport. The Tasche’s cap pushes on to close but it pushes on so deeply you don’t need to worry about it coming off in your pocket. This also means the section is long so there’s plenty of space for your fingers despite the small size of the pen. The section’s metal but not as slippery as some. There’s a clip, which I don’t like in a pocket pen but which is serviceable enough to do it’s job should you want it to. Lots of people have reported problems with OHTO nibs. I can only write about the one I have and it’s smooth and has a good flow. I’ve not had any problems with it at all. It’s a fairly generic “Iridium Point” and it’s only available in medium. There should be more options. The Tasche takes standard short cartridges. This means there are lots of options available. You’re going to struggle to get any kind of converter in there, it’s a very compact design, but you can always syringe fill if you wish. I like the OHTO Tasche a lot. 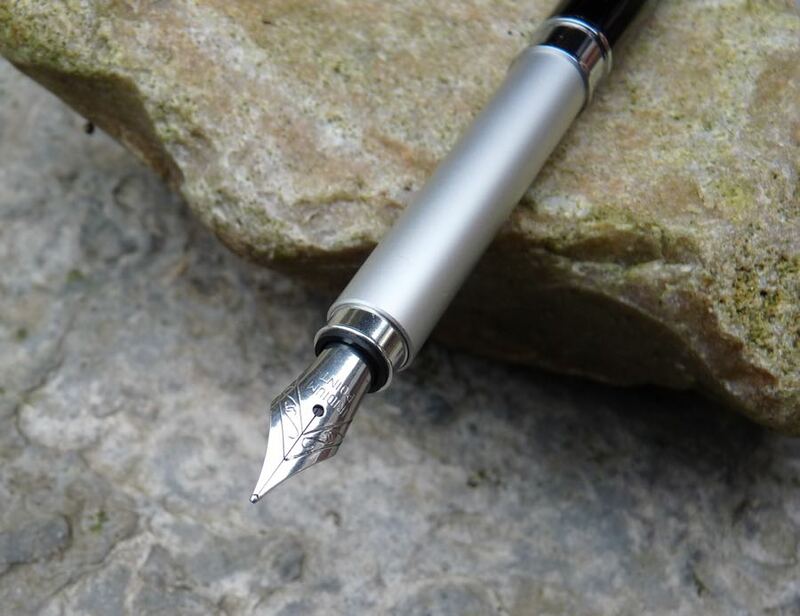 It’s a very good pocket pen and it’s a good writer. I’d like there to be more nib options and, personally, I wish there wasn’t a clip. Although I like this pen a lot, I’m only going to carry one fountain pen around in my pocket and that pen continues to be the Kaweco Liliput. I gave this pen to my wife who loves it. She left it in her pocket, it went around the washing machine and the tumble drier and… it came out undamaged and still usable. This pen is highly recommended if you’re a little bit forgetful. You can find some more reviews of OHTO Tasche on Pennaquod.